Chinese manufacturing giant, Xiaomi, is getting ready to unveil its upcoming flagship smartphone, Xiaomi Mi MIX 3. Today, the company officially announced that this smartphone will be released in an ancient venue – Forbidden City. 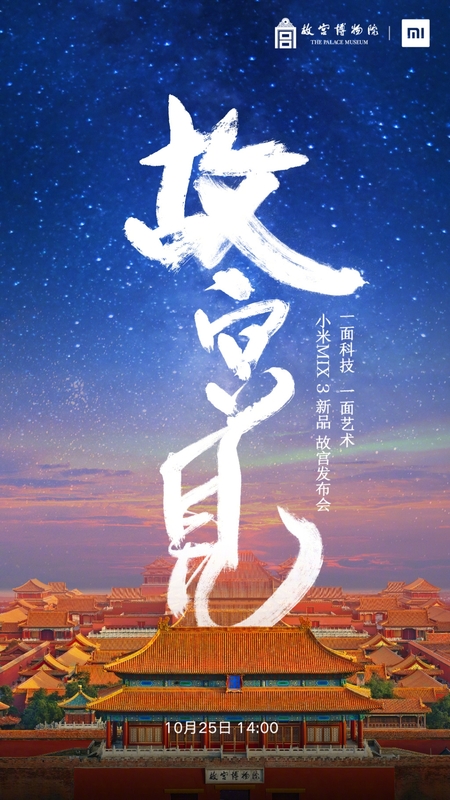 An official poster from the company reads “See you at the Forbidden City on October 25th!”. The Forbidden City used to be the palace of Chinese emperors in the old times up till the Qing dynasty. Also called Palace Museum, the Forbidden City is a palace complex in central Beijing, China. The former Chinese imperial palace from the Ming dynasty to the end of the Qing dynasty. The Xiaomi Mi MIX 3 emphasizes “one technology, one art”, which coincides with the artistic environment of the venue. The Beijing Palace Museum came into existence on October 10, 1925 (before then, it served as Chinese emperors palace). It is a comprehensive Chinese museum built on the foundations of the Ming Dynasty and the Qing Dynasty and its collections. It is also the largest museum of ancient culture and art in China. In other news, the company also revealed that the Xiaomi Mi MIX 3 will sport dedicated AI button. This means that there will be a unique button to activate Xiaomi Ai. Xiao Ai is Xiaomi’s proprietary smart voice assistant that comes with select Xiaomi phones. A voice assistant helps the user to complete functions easier, faster and with a single statement. You can send a text, off the light, make a call, set the alarm clock and more.